Ole Gunnar Solskjaer has brought the identity back to Manchester United and the Norwegian caretaker manager will stick by his attacking principles going into Tuesday night’s Champions League clash with Paris Saint-Germain. That’s the opinion of RTÉ football pundit and former Liverpool player Jim Beglin who believes that the former United striker has transformed the Manchester club in the short space of time that he has been in charge. United host PSG in the first leg of the round of 16 encounter on Tuesday night and Beglin believes that Solskjaer will keep his promise to play attacking football even against a European super-power such as the French champions. "They couldn’t come into it in better form," said Beglin, speaking on the RTE Soccer Podcast. "Ole Gunnar Solskjaer is coming in perfectly to the bigger stage now and this is a chance for Manchester United to take it on a level. "In terms of attacking ambition, he has got a lot more to give and I think we are going to see plenty of that against PSG." 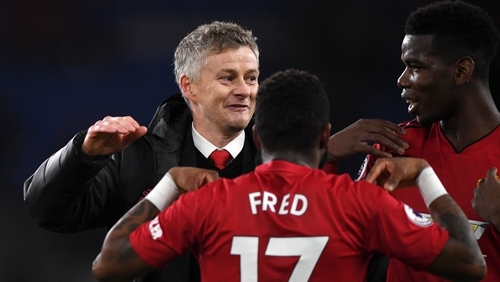 United remain unbeaten throughout Solskjaer’s eleven-game tenure and the former striker has already proved that he is able to get results against perceived better sides, most notably the 1-0 league victory away at Spurs. "When they won 1-0 at Wembley against Tottenham, we were all wondering what they were going to do, tactically," said Beglin. "Mike Phelan is the one responsible for a lot of this. They had a good look at how Tottenham set up, and the two full backs go very high. "I think essentially, against Paris, they will be on the front foot so I don’t think Manchester United will be tentative and just seeing what they can pick off, as they would have been under Mourinho. And Beglin credits a real change of atmosphere at Old Trafford to the new manager, who has transformed the club and lifted the gloom since taking over following Jose Mourinho’s departure. "Everythnig that was wrong under Mourinho has been righted because they didn’t have an identity, they seemed to be afraid to commit forward and were thinking about the ten yards behind them – that’s the mindset that Mournho creates. "There was no consistency in terms of with team selection or formation. The club was standing still. "And now Solskjaer has brought identity. He has followed up on the promise he made on day one saying, we are going to show courage in terms of our attacking play, we are going to be risk-takers and he has delivered all of that. "He has put a smile back on people’s faces." And while Beglin believes that the new manager’s instant impact at United has put him in the conversation to take over on a permanent basis, the overall decision may come down to how his side perform over the coming months as they aim to finish inside the top four, while also challenging in Europe. "The eleven games he has managed up to now - won ten, drawn one - have been a very impressive audition. His next eleven games might be what get him the permanent job." Follow Manchester United v PSG on our live blog here on RTE.ie and watch the game live on RTE 2 and the RTE Player.